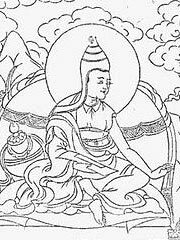 Maitreya-nātha (ca. 270-350 CE) was one of the three founders of the Yogācāra school of Buddhist philosophy, along with Asanga and Vasubandhu. Scholars are divided in opinion whether the name denotes a historical human teacher or the bodhisattva Maitreya, used pseudepigraphically. The number of works attributed to him vary in the Tibetan and Chinese traditions but variously include the Yogācara-bhūmi-śāstra, the Mahāyāna-sūtrālamkāra-kārikā, the Dharma-dharmatā-vibhāga, the Madhyānta-vibhāga-kārikā, the Abhisamaya-alamkāra and the Ratna-gotra-vibhāga. On the subject of Maitreya-nātha, there are opposing views of historians of Buddhism. Some believe that this is a historical character, a teacher who spoke with Asanga, others — about pseudo-epigraphy, when Asangi’s books were attributed to Bodhisattva Maitreya. In Tibetan and Chinese traditions, he is credited with a slightly different list of works. The epithet «nātha» in Buddhist hybrid Sanskrit means «protector» [of all living beings].